Georgia Urology’s own Dr. Jeffrey Proctor presents an overview of interstitial cystitis (IC), including symptoms, treatments, at the Interstitial Cystitis Association’s (ICA) patient forum titled “IC from A to Z”, held in Atlanta, GA, on August 23, 2009. The ICA is a non-profit health association that is committed to enhancing the quality of healthcare and lives of people living with interstitial cystitis. Learn more in the lecture below! Join the physicians of Georgia Urology as they host two free Men’s Health seminars this March. Dr. Lawrence Goldstone will be discussing the latest treatment options available for erectile dysfunction and bladder leakage and Dr. Edan Shapiro will be covering benign prostatic hyperplasia (BPH). We recommend that anyone who is seeking information on these conditions come out and learn more. Free refreshments will be provided. 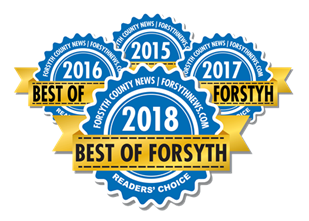 We are proud to announce that Georgia Urology has been recognized in Forsyth county’s 2019 Best of Forsyth magazine! Georgia Urology is being honored as an organization that is committed to providing the very best in urologic care and services to the Forsyth community. If you’d like to schedule an appointment at our Forsyth location, click here!